It has started to feel like fall in my neck of the woods. 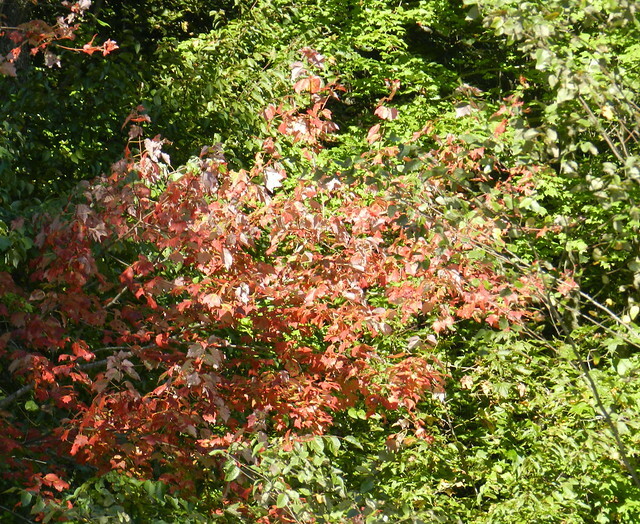 It is still only in the beginning of fall color but we've started to get the chilly weather I love. This week will be a mix with some warm days but the nights will remain cool. I love change so the beginning of each season is my favorite time. The first trees to change colors always stand out against the ones that are later to change. 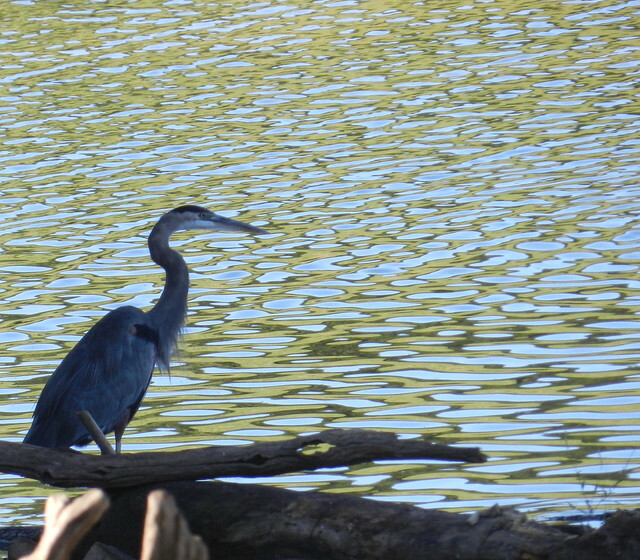 I was so focused on the trees I almost missed the great blue heron. 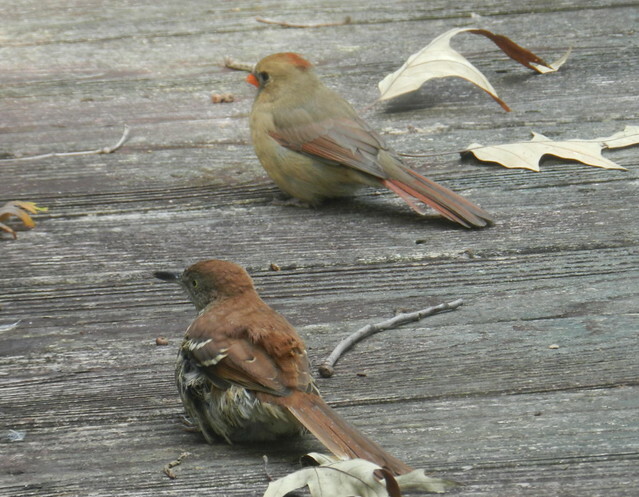 The female cardinal and brown thrasher looked companionable until they both headed for the bath. The male cardinal looked like he was debating a bath. Later this month we're heading to the mountains for a vacation. I live in central NC so it's an easy drive west to the mountains or east to the beach. Click here for nature notes or here for Our World Tuesday. Happy Vacation! Where we lived in Oregon was just like your neck of the woods in that it was very easy to get either to the mountains or to the coast. We loved that too! 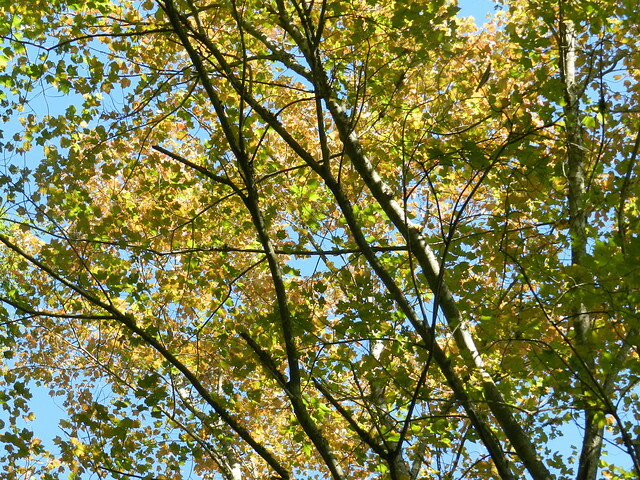 Such beautiful Fall color -- that one leafy tree looks like golden lace against the sky. And of course I love the heron (glad you didn't miss him). Wonderful photos. You are catching up to us and our colours! Beautiful set of images. Nice variety. The morning chill of autumn is so refreshing after a hot summer. Touches of color are everywhere bringing nice contrast to the green. 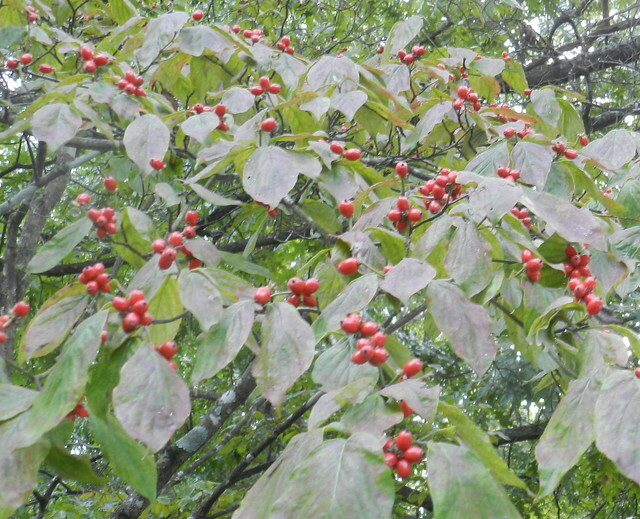 Your last photo reminds me that small red berries that the birds seem to love also pop up. My holly tree is loaded with them this year. Wonderful glimpses of autumn and its beautiful colors!! I do love the changing seasons! Like Sallie, one thing I love about living in Oregon or Washington is how easy it is to get to the mountains or the coast!! Have a great week, Carver!! 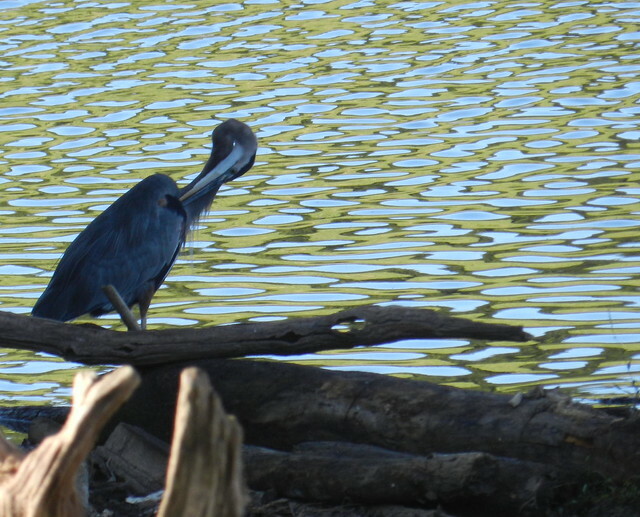 My favorites are the Great Blue Heron and the cute little birds but all of your photography is wonderful! A mountain vacation sounds wonderful enjoy! Have a happy week! 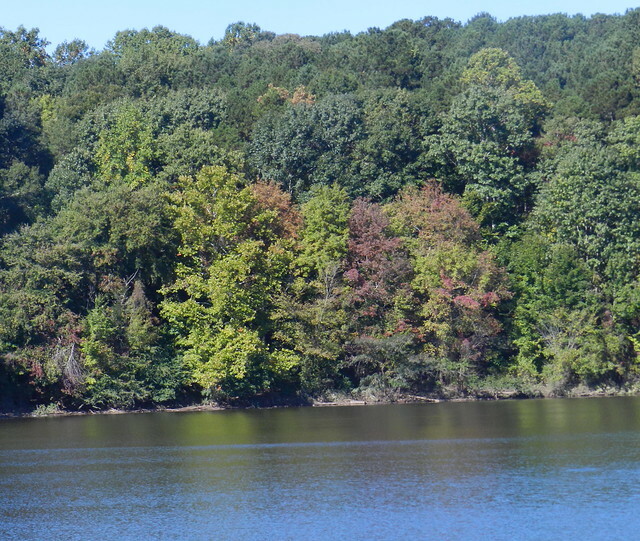 full fall foliage is just around the bend for you. we have a ways away here. happy monday and enjoy the rest of your week. wonderful fall images. you are a little further south so color changes comes slower to you....but hold on it's coming. 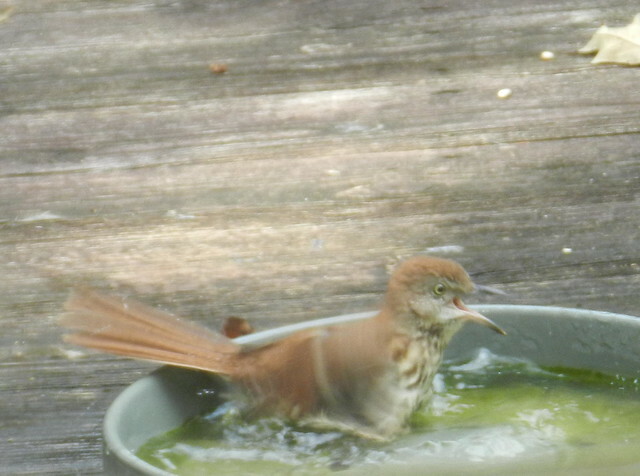 Interesting the Brow Thrasher won the battle of the birdbath! Really interesting water patterns and colours in the heron photo. Carver you can see fall is dressing up for you too...soon it will be a whole spectacular there!! Have fun in the mountains. 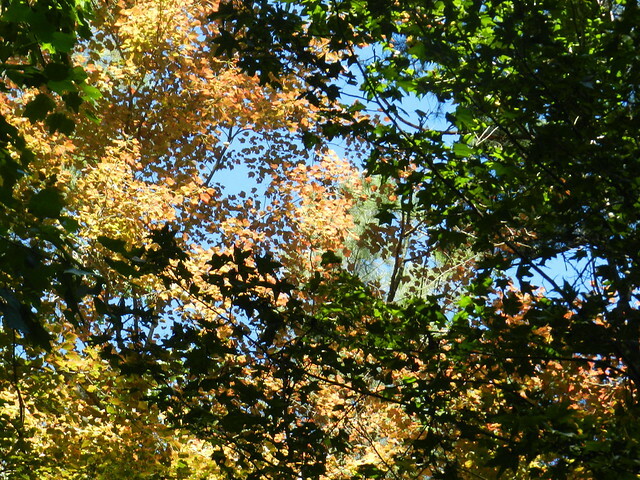 I bet you'll see even more fall foliage there! We couldn't believe our eyes when a Great Blue Heron flew above our heads last week while we were walking through the forest. I've never seen a heron at our altitude. 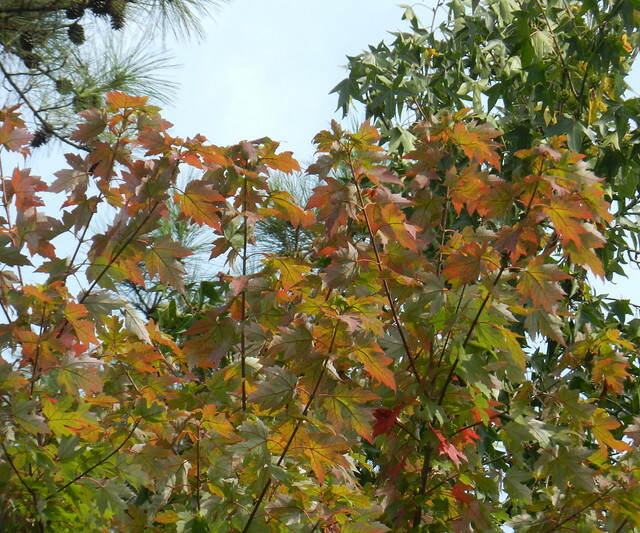 I am so loving your fall colors! We don't get many here in New Zealand as most of the trees are pine. Your birds are so colorful. 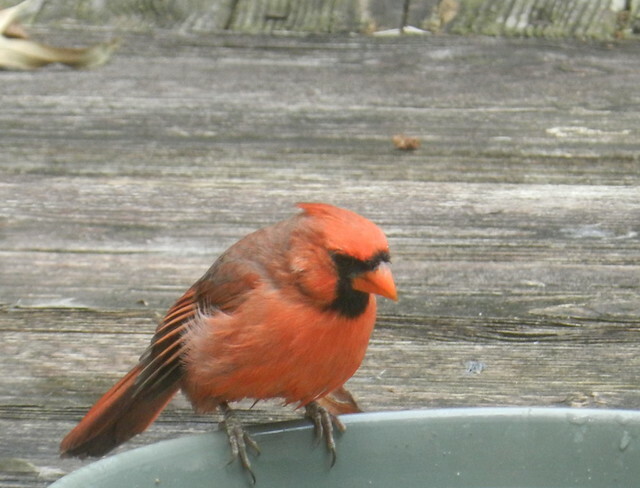 I like the male cardinal in the bath.